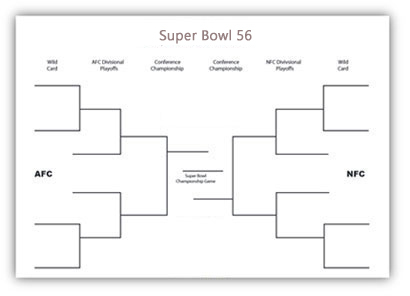 In case you are on a look out for the printable 2019 NFL Super Bowl 53 easy to edit and print brackets, you are certainly finding yourself at the right location and at the right time. Open Sportsbook USA has been working in the sports business for a long period of time now and each and every season we offer to our readers NFL Playoffs printable brackets to share with friends or office workers and at the same time all this information is going to be archived. 2019 NFL Super Bowl barcket for free. The 2018/19 NFL Printable Playoff Bracket will be changed every round, especially when it gets closer to the superbowl, this way you can easily bookmark the page and can visit back to print the updated version of the bracket throughout the playoffs up until the Super Bowl. Super Bowl 53 will be held on February 3rd, 2019 in Atlanta, Georgia. 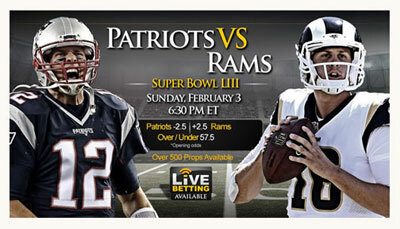 Dont forget to print out the super bowl 100 boxes and enjoy them with friends and family.